I used the leftover paper from a previous Artbooking cut to make the sun and the Art Philosophy with the centerpoint feature to cut the circle photo! Stickease gave me the perfect journaling block! 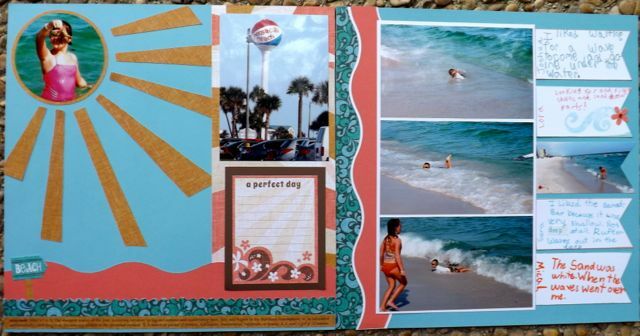 On the right page I used the old Creative Memories Cutter to make the wavy border! On the right side the banners were used for journaling blocks. Each one of my kids wrote their favorite part of their first real trip to the beach! I also entered this in the Creative Belli Blog's Summer Challenge!